Collyhurst, Manchester, Then & Now. Photo taken after the Luftwaffe air raid on Manchester of 2nd June 1941. This is Fitzgeorge Street in Collyhurst. The bomb fell at the bottom of the embankment, taking out the houses on the left. 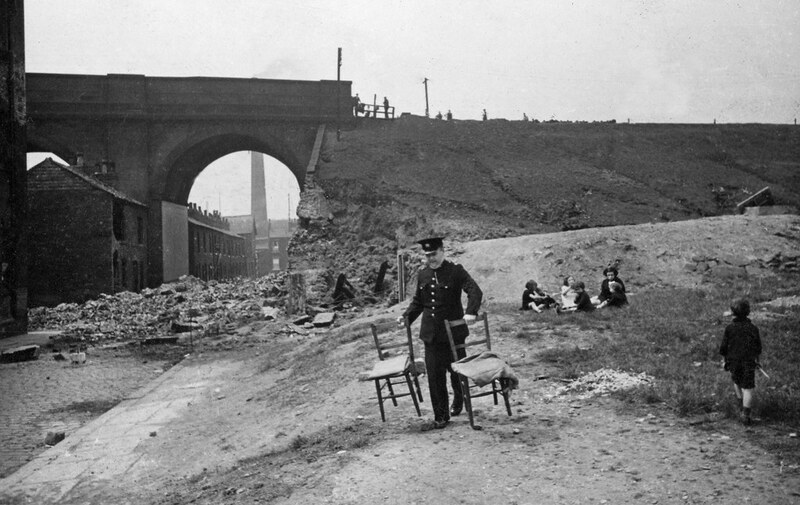 The houses on the other side of the viaduct and at the end of the street have all since been demolished as have the mill just visible at the left edge of the original photo (below) and the chimney visible through the arch. The cellars underground are all that remain. From what I can gather from the casualty lists, no-one was killed here. It’s not clear what’s going though. Possibly the Policeman is recovering chairs from one of the bombed out houses? And the children on the ground could be from one of those houses? 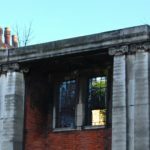 Just 120 metres south along the railway line from here, St Oswalds School in Gorton Street was hit for the second time; a bomb had previously landed right next to the school on 7th October 1940. This is on the Manchester – Bury line, between Victoria and Woodlands Road. Original photo used with kind permission of Greater Manchester Police. The original photo used with kind permission of Greater Manchester Police. Very clever composition Ian. Informative too. you waited for a train to pass 🙂 I should have a go at something like this, they are excellent. Another superb piece of work, well done. 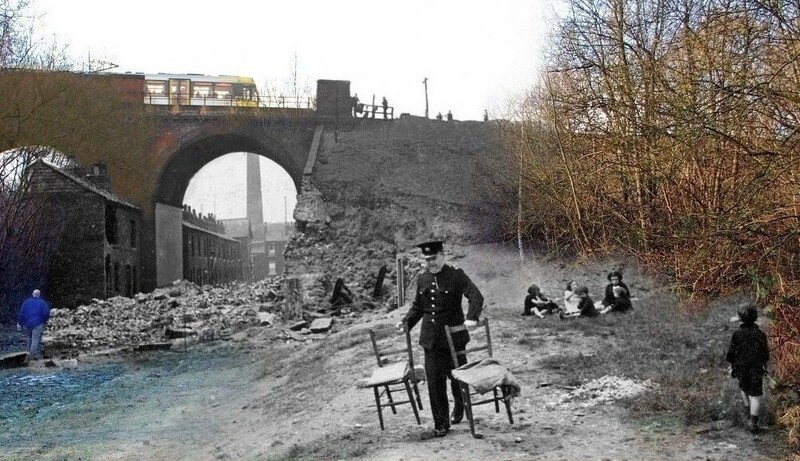 It wasnt a bomb ,but I remember as a kid a railway bridge made of red brick collapsing across the road in Rochdale near the baths …..it looked a lot like this . Another great peice of work Ian. There really is a book in this hobby folk cannot get enough of what things were like shots …..theres loads of books of Tod and they do alright …so a few specifically about the Manchester blitz done in this style would surely work . Just marvellous Ian – [http://www.flickr.com/photos/pasujoba44] is right – go for it. [http://www.flickr.com/photos/stiemer] [http://www.flickr.com/photos/southseadave] [http://www.flickr.com/photos/markmckie] [http://www.flickr.com/photos/kingfleab] [http://www.flickr.com/photos/29288836@N00] [http://www.flickr.com/photos/nondesigner] [http://www.flickr.com/photos/pasujoba44] Thanks very much guys, appreciated. A book? Yeah, it has been mentioned but as with the air crash sites Paul, I am not sure where to start. Besides, copyright might be an issue. 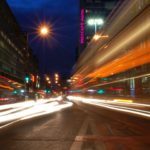 The photos I use are either with permission (as above) or for non-profit use with a creative commons licence. Besides, people can see them here for free! [http://www.flickr.com/photos/29288836@N00] That’s what I am aiming for with these photos, hence the inclusion of the tram and the man in blue, who was a surveyor, he told me about the cellars still being underground and added that in a couple of weeks the whole area would be fenced off so civil engineering work could start so I got there at just the right time! I don’t know how you manage to combine the photos so well but you do with every one you have shown us. Just makes you feel how closely the past and present are linked. Brilliant work again Paul – researching the incident and compositing the old and new into one view! Wonder if the viaduct or the factory was the aiming point for the bombs? Oh wow !!!! this is just superb Ian ….what a fantastic job you have done here mate …..
Love the work…and the research …..
You are a clever bugger! 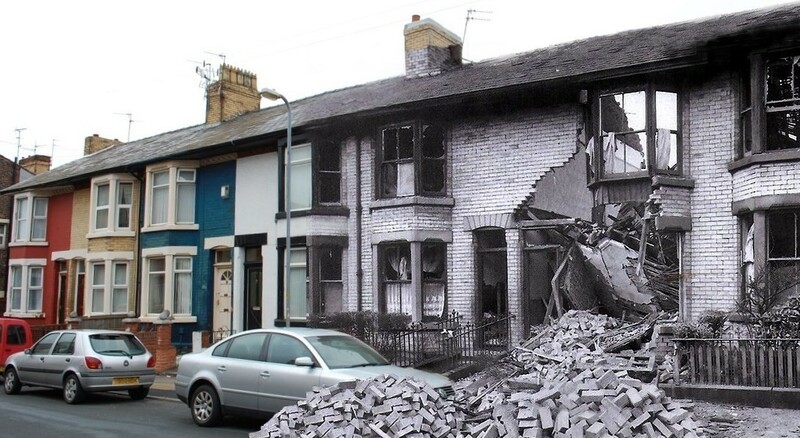 Another great then and now shot, perfectly blended and with great human interest to tell the story. An interesting piece of work. Great work again mate, love these blended then and now shots, as Kingsdude says they’re bringing history alive. Flickr’s not showing all your pics up my contacts for some reason again. really like this blended image, i think it’s because there is smaller hints of the modern bits [from past ones you’ve done] .. the scene is set with the older pic first and then the modern bits suddenly noticed. makes it interactive? either way, the concept is ingenious. I agree with Rob – You are a clever bugger. This is great work and very original. Thanks! This is soo very moving, I really find your work impressive ! Thanks very much for all the feedback everyone, it is what keeps me doing stuff like this. It is good when it all comes together. Grazie Michel, i figli della guerra, ci hanno reso quello che siamo oggi. [http://www.flickr.com/photos/angwickham] To be honest Ang I got a bit carried away, was erasing a bit here, a bit there and when I had finished and uploaded it I thought, There’s bugger all left of my photo! Oh well. My uncle who was seventeen at the time witnessed it,he was running to Fitzgeorge Street during the raid to check on his Granny and auntie when it dropped , fortunately he took cover just in time . A lucky escape there Elsie! Hope his older relatives were ok too.